A draft bill proposed by House lawmakers would direct the Pentagon to develop a U.S.-built rocket engine as a domestic alternative for the Russian RD-180 engine used on the Atlas 5 rocket. The legislation passed by a House subcommittee Wednesday calls for up the U.S. military to spend up to $220 million next year to kick off full-scale development of the engine, which could be ready for flights no later than 2019. The bill states the Defense Department "should develop a next-generation liquid rocket engine that is made in the United States, meets the requirements of the national security space community, is developed by not later than 2019, is developed using full and open competition, and is available for purchase by all space launch providers of the United States." The proposal is part of a draft 2015 National Defense Authorization Act passed Wednesday by a subcommittee of the House Armed Services Committee. The full committee is scheduled to propose amendments and vote on the bill May 7 before sending it for consideration by the full House of Representatives. If approved by the House and agreed to by the Senate and President Barack Obama, the legislation directs the military to pursue the "effective, efficient, and expedient transition from the use of non-allied space launch engines to a domestic alternative for the Evolved Expendable Launch Vehicle program." A separate appropriations bill must be passed to set a firm budget for the engine development. The United Launch Alliance Atlas 5 rocket's first stage is powered by a dual-nozzle RD-180 engine built by Moscow-based NPO Energomash and marketed by RD AMROSS, a U.S.-based company jointly owned by Energomash and Pratt & Whitney. No engine in the class of the RD-180 engine, which is fueled by kerosene and produces 860,000 pounds of thrust at sea level, is manufactured in the United States today. The Atlas 5 is a workhorse in launchings of military communications and navigation satellites, top secret intelligence-gathering payloads, and NASA's robotic science probes, such as the Curiosity rover on Mars. 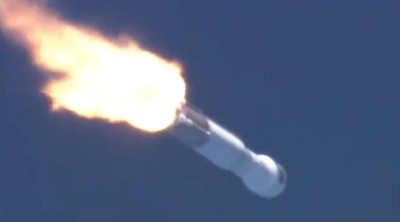 The RD-180 engine has a perfect performance record on 51 flights since 2000. The draft legislation would also direct Defense Secretary Chuck Hagel to work with NASA Administrator Charlie Bolden to "ensure that the rocket engine developed meets objectives that are common to both the national security space community and the civil space program of the United States." Lawmakers also request NASA and the Defense Department submit a report within six months of the enactment of the authorization act spelling out a plan for development of the engine, an analysis of the benefits of a public-private partnership, the estimated development costs, and the requirements for the engine. A similar authorization bill for NASA approved by the House Science, Space and Technology Committee this week also includes language on a new rocket engine, requiring NASA work with the Pentagon on its development. A judge in the U.S. Court of Federal Claims issued an temporary order Wednesday barring United Launch Alliance from purchasing any additional Atlas 5 engines from NPO Energomash. Judge Susan Braden granted the injunction after SpaceX filed suit asking the court to stop the U.S. Air Force's sole-source $11 billion award in December of a block of 27 satellite launches to ULA, which formed in 2006 from the merger of Boeing and Lockheed Martin's Delta and Atlas rocket programs. The Atlas 5 and Delta 4 rockets were developed in the 1990s under the Air Force's Evolved Expendable Launch Vehicle program intended to replace more costly military satellite launchers with modernized, less expensive and more capable vehicles. But the commercial launch market for the Atlas 5 and Delta 4 never materialized, and competition disappeared when the programs merged under the United Launch Alliance banner. In the lawsuit, SpaceX says it can launch the missions awarded to ULA at a fraction of the cost. ULA says it has enough RD-180 engines in stock to support Atlas 5 launches well into 2016, and RD AMROSS recently signed a five-year contract to deliver more engines through 2018, according to Matthew Bates, a Pratt & Whitney spokesperson. The injunction issued Wednesday "does not extend to any purchase orders that have been placed or moneys paid to NPO Energomash prior to" April 30. 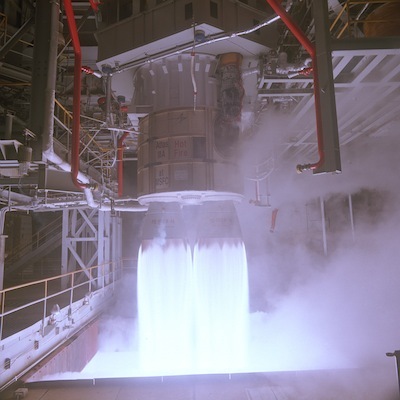 Bates told Spaceflight Now in March that RD AMROSS has a license to produce RD-180 engines in the United States, but industry officials estimate it would take five years and $1 billion to start building the engines domestically. SpaceX claimed in an April 28 court filing that the rocket engine purchases from Energomash violate U.S. sanctions imposed on top Russian government officials, including deputy prime minister Dmitry Rogozin, whose portfolio includes leading the aerospace industry. "Mr. Rogozin is on the United States' sanctions list as a result of Russia's annexation ofthe Crimea," SpaceX said in its complaint filed Monday. "In other words, under the ULA contract, the Air Force is sending millions of dollars directly to an entity controlled by Russia and to an industry led by an individual identified for sanctions." In the complaint, SpaceX requested the court open all of the single-core Atlas 5 and Delta 4 launches awarded to ULA in December to competition. Several of the missions contracted to ULA require launches of the Delta 4-Heavy rocket -- a vehicle powered by three first stage cores -- which exceeds the lift capability of SpaceX's Falcon 9 satellite booster. SpaceX is developing a larger rocket called the Falcon Heavy, but it will not enter service until at least early 2015. The Delta 4 rocket's main engine is the RS-68, a hydrogen-powered engine built in the United States by Aerojet Rocketdyne.